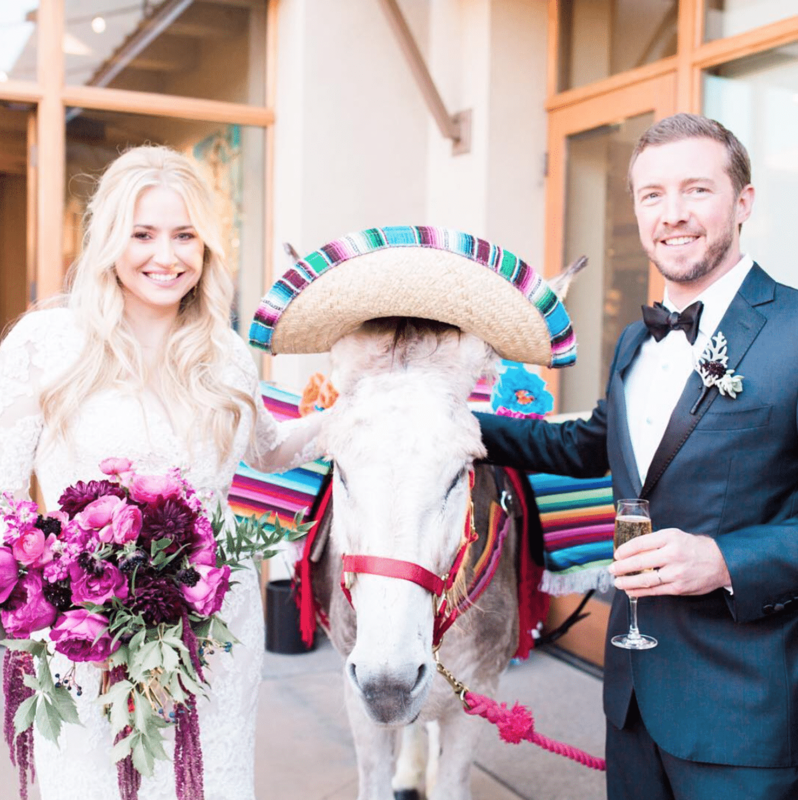 For Kristen and Lea’s Santa Fe wedding, we created an elaborate crest inspired by the natural beauty of the surrounding landscape. Succulents, cacti, and birds, tied together with southwestern patterning, form the frame around the couple’s custom cipher monogam. Gold foil on grey stock drew upon the dramatic glow of golden sunlight across desert mountains. 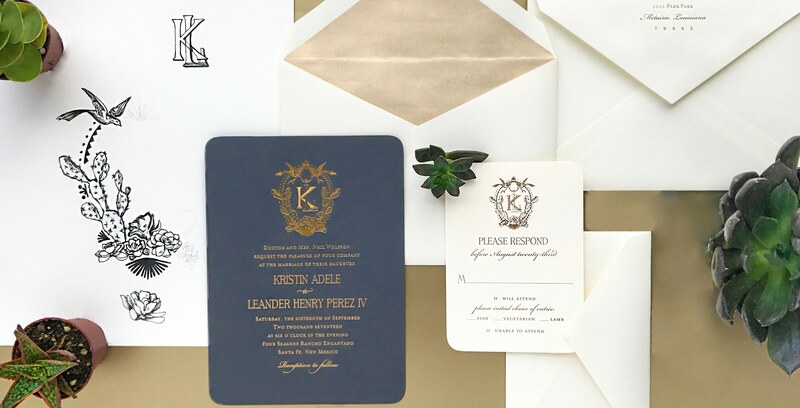 The grey, cream, and gold palette of the wedding invitation struck a tasteful balance with the more playful and vibrant palette of the wedding accessories. We were privileged to work with Kristin Wolfson, a local artist known for her whimsical use of color and sense of magical realism. 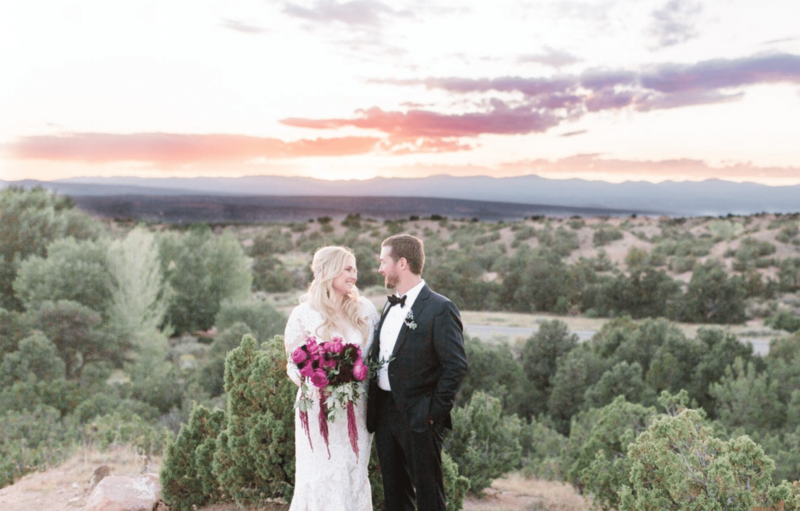 The desert sunset casts a soft, dusky glow on the handsome couple and surrounding landscape. 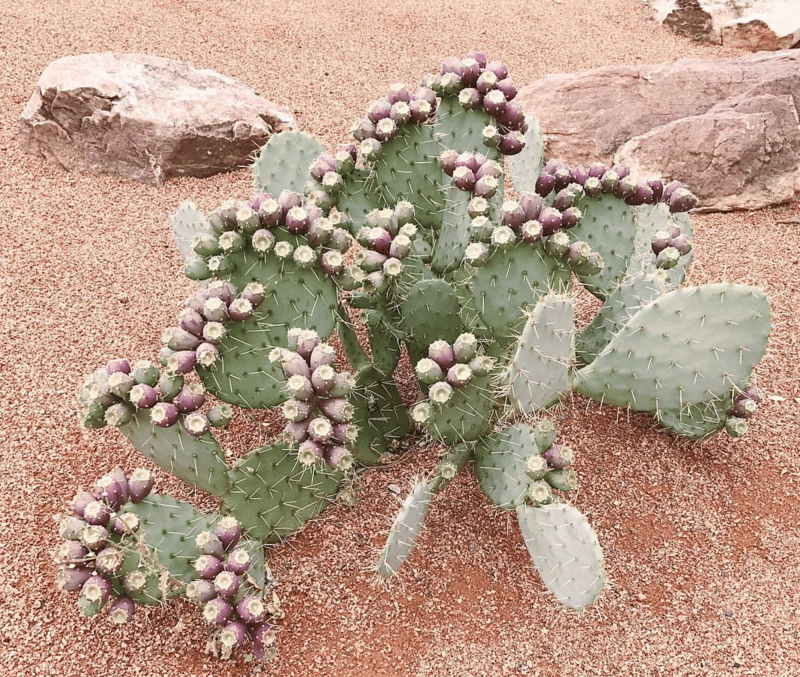 The star of Kristin and Lea’s custom monogram frame, the prickly pear cactus, in its natural habitat. 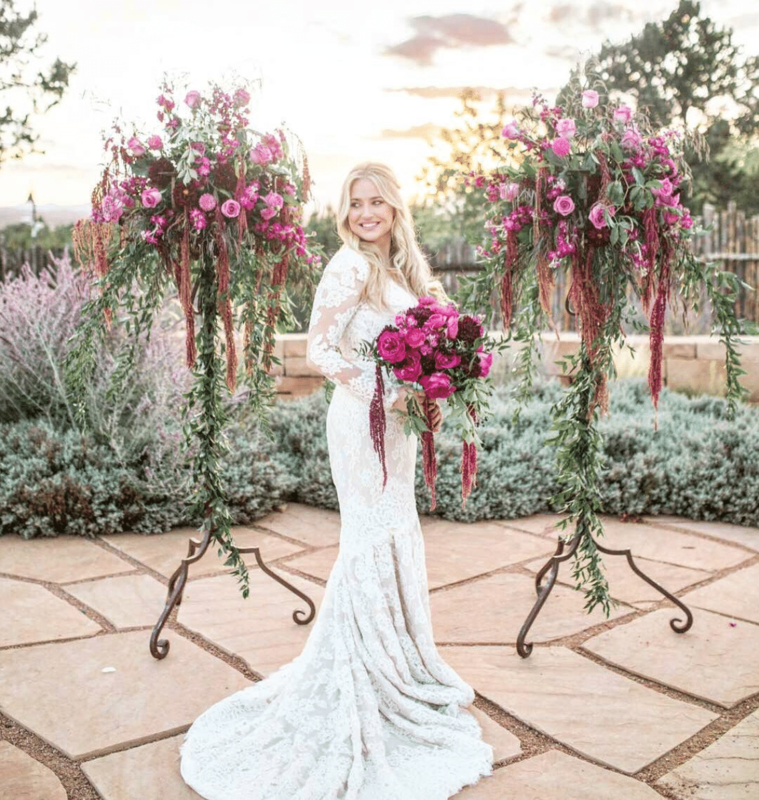 Kristin surrounded by cascading magenta floral arrangements. The colorized monogram crest for the wedding accessories captures the range of colors exhibited in the desert landscape and sunset. The magenta border color on the menu is pulled directly from a prickly pear margarita, served at the rehearsal dinner. 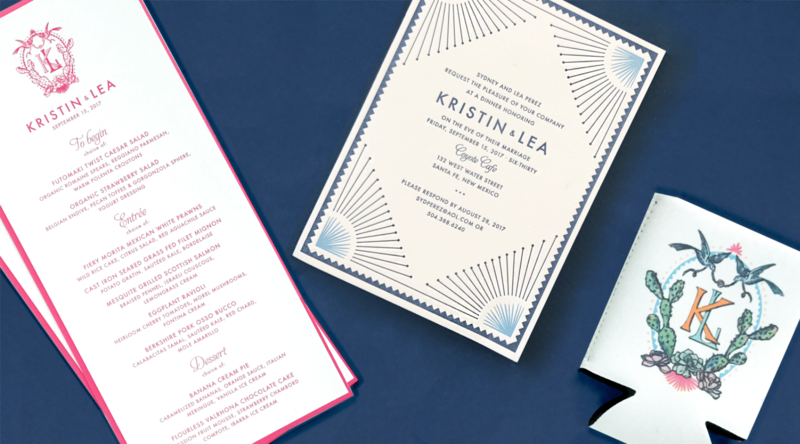 A continuation of the southwestern textile patterning from the monogram takes center stage on the rehearsal dinner invitation. Kristin and Lea certainly know how to make an exit. We will watch them ride into the sunset any time.